If you’re looking to lose weight, or improve your health and well-being generally, diet is a key component and it makes sense to start by making changes to the first meal of the day, breakfast! Most people pay little attention to what they eat for breakfast, often opting for the default options of cereal, or toast, or in many cases skipping breakfast altogether. But getting this meal right at the start of the day can give you a healthy boost that’ll make you feel great and you’ll carry it with you all day long. 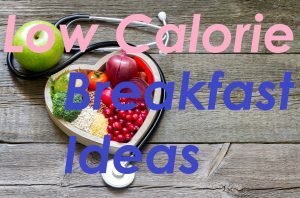 If you’re a fan of intermittent fasting, or the 500 Calorie diet, you’ll need some low calorie breakfast ideas. 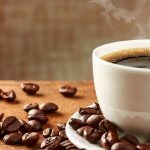 In this article we’ll look at why breakfast is important, before diving into some specific breakfast recipe recommendations. 0.1 Why is Breakfast Important? Breakfast is often referred to as “the most important meal of the day” and it’s an incredibly accurate description due to the influence that breakfast has. Not only can it be tasty, but it also plays a crucial role in enhancing our mental and physical performance over the course of the day. Whilst you may be thinking that this sort of outlook is only the preserve of professional athletes or those with a highly physical job, this couldn’t be further from the truth. Everyone needs breakfast due to the benefits it can bring to your daily life, so making it part of your morning routine can help you prepare for the day ahead. Despite a past reluctance to embrace breakfast, Americans have gradually come to realize that breakfast shouldn’t be dismissed as a mere frivolity. And, with the majority of Americans now eating breakfast around 361 times a year, it’s a meal which is now becoming highly important. Naturally, this focus on breakfast has led to a lucrative market forming, so it’s no surprise that fast food restaurants are investing heavily in breakfast with portable foods such as sandwiches and yoghurt proving popular. Whilst the convenience of fast food may fit in with the demands of the early morning rush, some demographics are rejecting this approach; millennials, in particular, prefer to prepare fresh, sit down meals such as eggs and fruit with yoghurt. Carbohydrates provide the body with its main source of energy, so are vital for breakfast. However, rather than simple carbs (e.g. 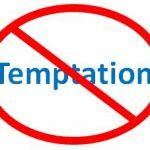 cereals, cookies and juices) which create only short bursts of energy, you need to eat complex carbs (e.g. vegetables, pulses and wholegrains) which provide a slow, but constant supply of energy to maintain your performance. Proteins main role is to repair the body’s tissues. And, in order to help keep your body functioning effectively, it needs to be in good working order, so protein helps you maintain your physical prowess. 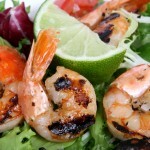 Some of the most common protein sources are nuts, seafood, eggs and lean meat. Fats are an important component of your diet as they’re an effective energy source for your body. There are, however, good fats and then there are very bad fats. Goods fats (or unsaturated fats) are found in avocadoes, nuts, oily fish and olive oil. 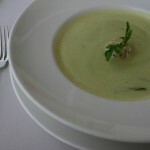 Bad, unhealthy fats (or saturated fats) and are found in butter, red meat and cheese. Fiber is an important part of your diet as it helps to aid the digestion process and ensure you’re not left feeling bloated. Foods rich in fiber include pulses, vegetables and whole grains, so including these sources in your diet can make a real difference. Hydration and fluids are also really important in the morning. A glass of water early in the morning helps to re-hydrate you after a long nights sleep. 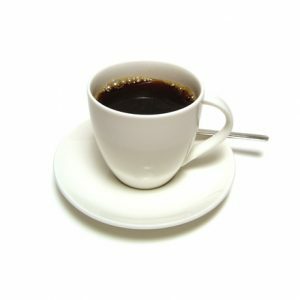 And if you need a caffeine boost in the morning, black coffee is an excellent option that comes with almost no calories. Many people also enjoy tea in the morning, and a cup of tea with just a splash of milk won’t impact your calorie count by much. 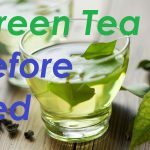 Green tea is also very popular, whether early in the morning or at night. You’re probably beginning to understand the importance of breakfast and the need for a healthy breakfast, but where do you start? There are so many options available that analyzing them and narrowing them down to suitable meals may seem a daunting task. 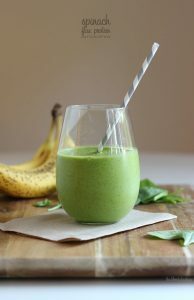 Spinach Flax Protein Smoothie – Protein smoothies aren’t just for bodybuilders, they’re for anyone who wants a healthy breakfast that meets all your body’s nutritional demands. The spinach is rich in vitamin A, the chia and flax seeds deliver the necessary fiber and fat whilst, finally, the almond milk and protein powder provides the protein. (231 calories). Sweet Potato, Black Bean and Avocado Burritos – You may be thinking that burritos are more of a lunchtime or evening meal, but they’re a great option for breakfast as well. Instead of filling them full of bacon, sausage and white potatoes, try this recipe which combines the natural sweetness of sweet potatoes complex carbs and the good fats from avocados. Chuck in egg whites and black beans to provide all your protein needs. (297 calories). 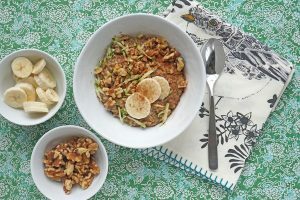 Zucchini Bread Oatmeal – This healthy breakfast in a bowl gathers together a collection of fantastic nutrients and builds them around the central ingredient of zucchini. The oats provide complex carbohydrates, the walnuts bring unsaturated fats and protein to the meal whilst the zucchini provides fiber. To make it even healthier, remove the sugar and syrup. (300 calories). Egg Muffin Cups – Muffins may traditionally be associated with mounds of sugar and chocolate, but savory muffins such as this are a healthy breakfast choice. 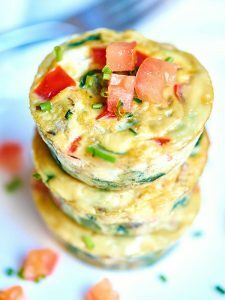 The wide range of vegetables in the egg muffin cups contribute fiber and vitamins whilst the eggs serve up the fats and protein to fuel and repair your body. (50 calories per cup). Ricotta Avocado Toast with Poached Egg – Packed full of flavor, this open sandwich (which neatly eliminates the need for two slices of bread) is responsible for bringing you that bit closer to all your nutritional needs; fiber and fat are supplied by the avocado, protein is offered by the poached egg and the slice of bread adds a healthy dose of complex carbohydrates. (269 calories). 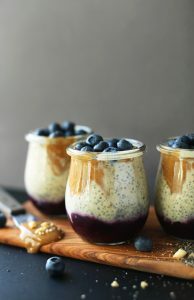 Peanut Butter and Jelly Chia Pudding – Breakfast can be sweet and healthy, just take a look at this delicious peanut butter and jelly chia pudding which can be made overnight. Mixing all these ingredients together could be a recipe for taste disaster, but it’s actually an incredibly nutritional meal. Chia seeds are rich in complex carbs, but also come packed full of protein and fiber. And the best thing is that this breakfast is ready to go after the overnight soak. (211 calories). At less than 300 calories each, these recipes will give you a really healthy start to the day. 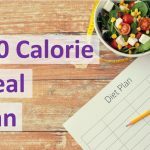 If you wanted to reduce the calories even further so you can spread out consumption on your fast days, you could cut down the portion size slightly. And breakfast needn’t be a hassle. 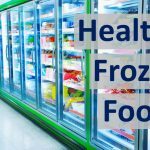 By preparing meals in advance you can have a stock of healthy frozen foods available to you each morning. 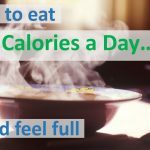 Weight Control – Skipping breakfast may sound as though it’s the ideal way to save a few hundred calories, but it can actually cost you more throughout the day. A healthy breakfast can stop you craving unhealthy foods by keeping hunger pangs at bay, particularly those which are high in protein. Kickstart your Metabolism – Your metabolism is the measurement of calories your body needs to function at its optimal capacity. Physical activity keeps your metabolism ticking along, but it slows down dramatically when you sleep. However, you can kickstart your metabolism in the morning by eating breakfast as this initiates the digestion process which, in turn, stimulates your metabolism. 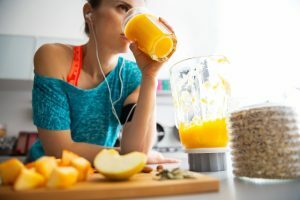 Provides Fuel for the Day – As evidenced in the recipes above, a well thought out breakfast can deliver the fuel that your body needs to get through the exertions that everyday life throws at you. It may appear a well-worn analogy, but the human body is very similar to a car: fill it with fuel and it will run and run, but let it run out of fuel and it will break down and come to a halt. Creates a Positive Start – Getting up in the morning is never easy, but you can make it a more positive experience if you’re willing to take the time to make breakfast. Although it’s a chore, it’s one which provides you with a sense of focus early on and this positive outlook pays dividends in ensuring you leave the house feeling happy and ready to take on the world. Be Wary of Juices – Fruit juices may appear to be bursting with nutrients, but shop bought juices are often loaded with added sugar and can quickly send your calorie count through the roof. Home-made juices are much more natural, but even natural sugars are not recommended in high doses so try to limit your servings. Breakfast Bars are not the Answer – Time is a scarce commodity in the mornings, so that’s why many people reach for breakfast bars. And, whilst they’re certainly convenient, they’re actually packed with lots of sugar and calories. Instead, take the time to have some peanut butter on wholegrain bread if you’re looking to save time. Don’t Overindulge – Even the very best breakfast options can become healthy if you overindulge e.g. two eggs are good, but four eggs are bad due to the fat content involved. Therefore, you need to understand exactly what one serving looks like and the amount of nutrients involved, this will ensure you have the perfect portion size. 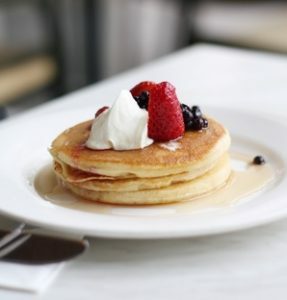 Limit the Treats – Breakfast would become very boring if you never indulged in pancakes and waffles, but these should be limited to a rare treat rather than becoming a norm. However, you should certainly treat your sweet tooth once or twice a fortnight as this will prevent you having a sugar fuelled binge one morning. Making a conscious decision to change your habits and start eating a healthy breakfast could be the driving force to a new, healthier you. Research has shown time and again that people who have a healthy breakfast are more likely to eat better throughout the day, and less likely to be overweight. By following the recipes outlined above, you could make the mindset shift required to become someone who generally eats more healthily and is in better shape. Not all of these recipes will be to your taste, but by experimenting and finding one or two that work for you, both in terms of prep time and taste; you’ll be well on your way to building better, more positive habits. And by combining this with an effective exercise regime, you’ll hit you fitness and weight loss goals in no time at all!